Road ecology is a relatively new field of expertise formalized 30 years ago, while roads are well-established across the landscape. As a result planning for and optimizing where road ecological measures are most needed is sometimes a daunting task. Eco-Kare specializes in keeping up to date with decision-making processes, legislation and criteria that are required to feed into a planning scheme for road agencies. Eco-Kare then uses Geographic Information System technologies to prioritize where mitigation is most needed. Eco-Kare was retained by Raisin Region Conservation Authority to map on-road turtle information that included nesting locations, and where turtles were found alive and dead on county roads. The data was then used to predict where fresh-water aquatic turtles were most likely to be found within the road network (hotspots). 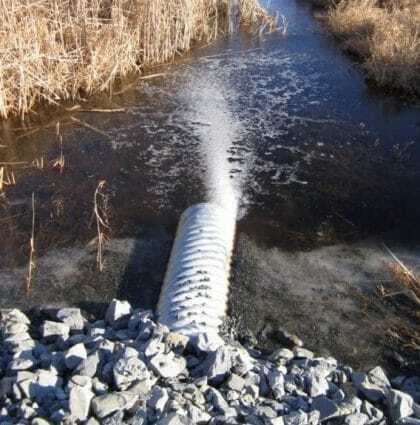 In addition, a culvert inventory was conducted that evaluated existing drainage culverts at hotspots for turtle passage. Eco-Kare International. 2015. Prioritizing locations where mitigation is most needed for turtles on roads in Raisin Region watershed. Final report submitted to the Raisin Region Conservation Authority with funding from the Ministry of Natural Resources and Forestry Habitat Stewardship Program, Cornwall, Ontario. 28 pp. Eco-Kare worked with the Ontario Ministry of Transportation from 2013 to 2015 to develop planning tools that would prioritize where mitigation is most needed for Endangered turtles, and snakes, and for larger animals on the provincial road network. 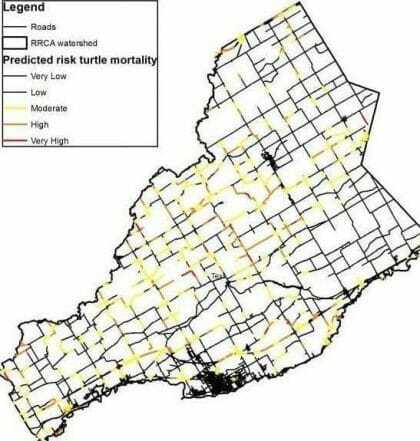 Turtle hotspots were based on a predictive model extrapolation and large animal hotspots based on Ontario Provincial Police wildlife collision data from 2000 to 2010. Ministry of Transportation. 2015. MTO Wildlife Mitigation Program Analysis and Tools. 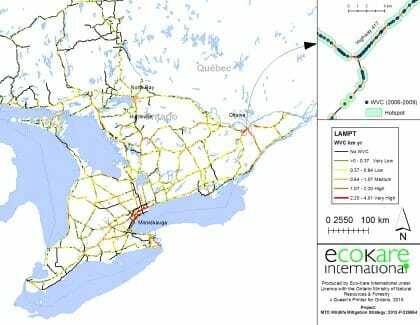 Final report by Eco-Kare International submitted to the Ministry of Transportation, St. Catharines, Ontario. 188 pp.